Polar stratospheric clouds over the Arctic. Although the 1987 Montreal Protocol banned the use of ozone-depleting aerosols such as chlorofluorocarbons (CFCs), they will remain in the atmosphere for some time and continue to damage ozone, particularly when temperatures in the stratosphere - where the ozone layer lies - drop below - 78°C. Ozone depletion is more pronounced at the poles, although more so over Antarctica due to specific climate conditions there. However under the right conditions, significant ozone depletion can happen in the Arctic as well, but to a lesser extent. Dr. Björn-Martin Sinnhuber from the the Institute for Meteorology and Climate Research (IMK) at the Karlsruhe Institute of Technology is an expert in the study of trace gasses in the atmosphere using remote sensing technologies, including a wide variety of satellites. During the winter of 2010-2011, Dr. Sinnhuber and his colleagues at IMK observed above normal ozone depletion over the Arctic. In this interview, Dr. Sinnhuber explains the mechanisms involved in the ozone depletion over the Arctic and potential ozone depletion trends during the 21st century. Could you give a short explanation of the work you’re involved with at your institute? In general, we contribute to a better understanding of the Earth’s atmosphere. We take data from satellite observations and other sources and analyze the results. These results are fed into global assessments and models. We’re particularly interested in the processes related to the changing of the ozone layer and how it has been recovering over the past few decades since the 1987 Montréal Protocol banned the use of ozone-depleting substances. A lot of our work goes towards international periodic assessments under the WMO and UNEP in support of the implementation of the 1987 Montréal Protocol, which banned the use of ozone-depleting substances. Your research focuses on the stratosphere. Why is this an interesting part of the atmosphere to study? For one thing, it’s where the ozone layer, which protects life on the surface of the Earth from much of the sun’s harmful UV radiation, is located. The stratosphere is also an important place to study interactions between atmospheric chemistry and possible influences from climate change. Is the winter of 2010-2011 the first time significant ozone depletion was observed in the Arctic? No. We have witnessed large-scale ozone depletion over the Arctic during the past 20 years or so. There was significant depletion during the cold winters of the 1990s as well, but the extent of the depletion was significantly smaller than what was being seen over Antarctica at the time. But during the winter of 2010-2011, for the first time, the amount of depletion over the Arctic was comparable to the depletion in the Antarctic ozone hole. Of course I need to be very precise when I say that. The amount of ozone present in the Arctic at the end of last winter was still much higher than what you typically find in the Antarctic ozone hole. However the degree of chemical depletion was comparable. 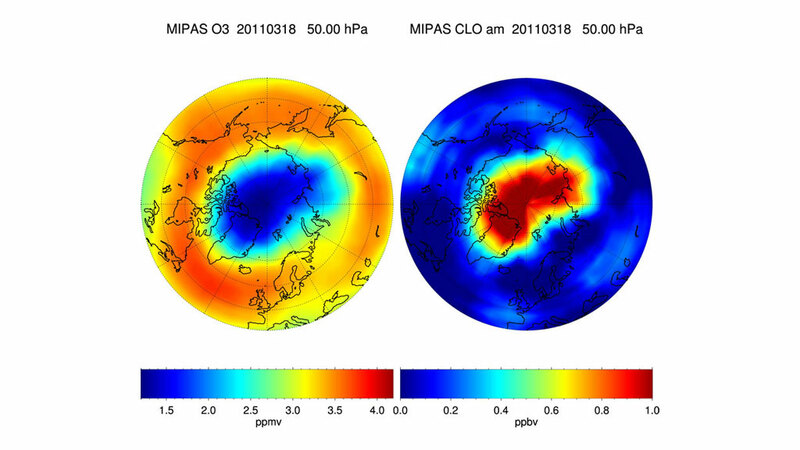 In general, ozone transport processes are more effective in the Northern Hemisphere than in the Southern Hemisphere. Ozone levels are already higher in the Northern Hemisphere at the beginning of the winter, and transport of ozone-rich air into the Arctic from lower latitudes during the winter offsets part of the chemical depletion. The unprecedented ozone depletion last winter led some of our colleagues to call this the “first” Arctic ozone hole. To some extent, the definition of what we call an ozone hole is rather arbitrary. As I said, there was already significant ozone depletion in the Arctic 10-15 years ago. But the winter of 2010-2011 saw unprecedented record levels of depletion that may justify calling this the “first” Arctic ozone hole. Why is there normally a larger ozone hole over Antarctica than the Arctic? Firstly, you have different transport processes in the Northern and Southern Hemispheres. Usually during winter in each hemisphere, ozone is transported from the low and mid-latitudes, where it is photochemically produced, towards higher latitudes, where it accumulates. In the absence of any ozone-depleting chemicals in the atmosphere, you would normally have an increase in ozone concentrations at higher latitudes. These transport processes are more significant in the Northern Hemisphere than in the Southern Hemisphere, so there is normally more ozone over the Arctic than over the Antarctic. Secondly, you have a specific temperature threshold below which ozone is destroyed. If the temperature in the stratosphere drops below -78°C, then polar stratospheric clouds can form. 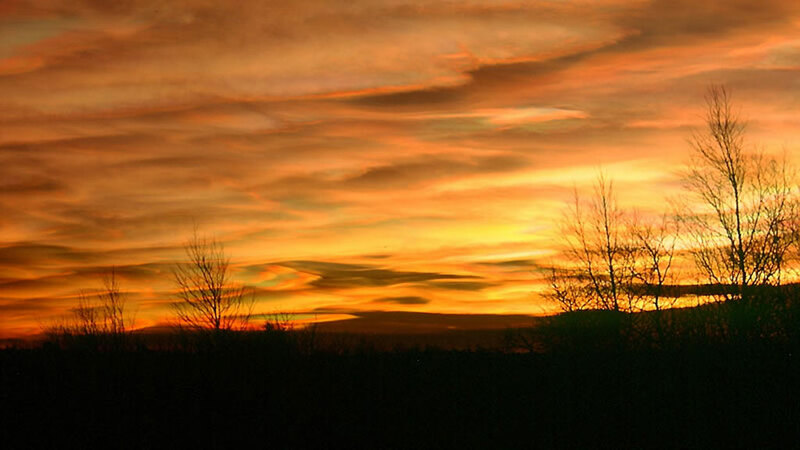 On the surface of these clouds, specific chemical reactions can take place, which can then lead to ozone depletion. The atmosphere over the Antarctic tends to be much colder than the atmosphere over the Arctic, so there is much greater ozone depletion in the Southern Hemisphere. Both the efficiency of ozone transport into high latitudes and the temperatures over the poles are related to the activity of planetary-scale atmospheric waves. A stronger wave activity leads to more vigorous atmospheric circulation. This pushes air polewards and downwards over the poles, which in turn leads to a warming of polar air. Is there a difference in the role atmospheric waves play in the Northern and Southern Hemispheres? Atmospheric waves play a much smaller role in the Southern Hemisphere than they do in the Northern Hemisphere. This has to do with the difference in the geography – the distribution of land, ice, and ocean – between the Arctic and Antarctic. In the Southern Hemisphere, Antarctica is a cold continent surrounded more or less symmetrically by an ocean. Winds there can blow with little disturbance. But in the Northern Hemisphere, you have a much greater contrast in the geography between land and sea. You have the colder continental interiors of Eurasia and North America and the warmer oceans in between. You have large mountain ranges like the Rockies and the massive Greenland Ice Sheet. All these factors lead to stronger disturbances in the atmospheric flow in the Northern Hemisphere, creating more wave activity. This is ultimately responsible for the warmer temperatures in the Arctic stratosphere compared to the Antarctic. So when the stratosphere over the Arctic got very cold during the winter of 2010 – 2011, this was a noteworthy event. Have temperatures in the stratosphere over the Arctic been decreasing? Not exactly. To be a bit more precise, what we and others before us have observed is that the coldest winters are getting colder in the stratosphere. If you look at all the winters over the past several decades, there is no clear cooling trend. a lot of atmospheric wave activity, then this draws temperatures away from a state that is mostly radiatively dominated to one that is more influenced by atmospheric wave disturbances. What we find is that the cold winters that are largely undisturbed by atmospheric waves and are instead more influenced by radiative processes appear to be getting colder. The climate models seem to reproduce these observations, but more work is needed before we can draw definitive conclusions. Does a build-up of greenhouse gasses in the lower atmosphere (troposphere) lead to a cooling of the stratosphere above it? The increase of greenhouse gasses in the lower atmosphere is absorbing and re-emitting infrared radiation back to the planet’s surface and trapping it there, leading to a warming of the lower atmosphere and at the surface. But with less infrared radiation getting transmitted into the upper layers of the atmosphere, the stratosphere and layers above it are cooling. This is relatively well understood from a theoretical basis and reproduced rather well in most models. On a global average, we find in the middle layers of the atmosphere and in the stratosphere in particular, a cooling trend that can be largely attributed to an increase in greenhouse gasses. However it’s a bit more complicated at high latitudes because of the influence of the large-scale atmospheric waves, which disturb the radiative-determined temperature tendencies. It makes the picture less clear. When we try to separate each of these processes, we see that the upper layers of the atmosphere in the Arctic are also cooling. And we find that in the stratosphere the coldest winters, which are more directly influenced by radiative effects, are indeed getting colder. If the stratosphere continues to cool, will this allow for more ozone depletion to take place? Yes, it’s possible. Thanks to the 1987 Montréal Protocol, use of ozone depleting substances has been banned, and their concentration in the atmosphere has been gradually diminishing. But it will be several decades before all the ozone-depleting gasses have been flushed out of the stratosphere. The interesting question is what will happen in the next 20 to 50 years. As the ozone-depleting substances are flushed out of the stratosphere, we expect the ozone layer to recover. However before this can happen, the stratosphere may become colder due to the increase in greenhouse gases in the troposphere below it. What we discovered in our recent study is that cold winters are getting colder in the stratosphere on the order of about 1°C per decade. This cooling would be sufficient enough to significantly postpone the recovery process for the ozone layer. Over the long term, at the end of the 21st century, if the Montréal Protocol continues to be followed and we don’t produce any more ozone-depleting substances, we expect that the concentrations of these substances will be so low that colder temperatures in the stratosphere won’t matter as much. As ozone-depleting substances are flushed out of the stratosphere at a rate of about 10% per decade or so, Arctic ozone depletion could still be an issue in 2050 if the stratospheric cooling trend continues. What kind of satellites are you using to measure the composition of the stratosphere? Most relevant for our study of the ozone layer was one particular satellite instrument – MIPAS (the Michelson interferometer for passive atmospheric sounding), which measures the spectral infrared emissions from the stratosphere. The instrument was developed here at the Karlsruhe Institute of Technology and has been in orbit on the European Space Agency’s EnviSat satellite since 2002. We process the data to derive global distributions of ozone and other relevant gases. The MIPAS instrument measures the infrared emissions from the atmosphere. This means it can be used even in the absence of sunlight during the boreal winter, which is quite important to investigate the processes related to ozone depletion. The other advantage is that with MIPAS we can see the individual spectral fingerprint of many different gasses in the atmosphere. We can measure not only how much of the ozone is being destroyed, but also take measurements of the other gasses directly involved in the depletion of the ozone layer. This means we can test our understanding and calibrate our models to be sure we have an accurate understanding of the underlying processes involved in ozone depletion. You’ve done an airborne campaign in northern Sweden recently. Could you explain what this was for? Our institute does a number of airborne campaigns. We use high-flying aircraft and high-flying balloons with instruments similar to the ones on EnviSat. One reason is to validate our satellite observations. We need to be able to validate the readings we’re getting from the satellite via other means. EnviSat has already been in orbit for 10 years. We need to make sure that its instruments are functioning properly from time to time. The airborne campaign that was conducted in December 2011 used the Russian Geophysica aircraft, which can reach an altitude of up to 20 km in the stratosphere. We tested a new generation of instruments that we hope will be installed on satellites to be launched a few years from now. We need to know how this new generation of instruments works under real conditions. Do you expect to see much ozone depletion over the Arctic this winter? The current winter started very cold again. During the December aircraft campaign, we observed widespread polar stratospheric clouds and elevated levels of chemicals that are involved in ozone depletion. But in late January 2012, a period of very strong wave activity occurred, leading to much warmer temperatures that slowed down these chemical processes. So as far as we can tell now, we expect to see some depletion of Arctic ozone at the end of this winter, but not on the same scale as last year. Björn-Martin Sinnhuber is a researcher at the Institute for Meteorology and Climate Research (IMK) at the Karlsruhe Institute of Technology, and an expert in the study of trace gasses in the atmosphere using remote sensing technologies.